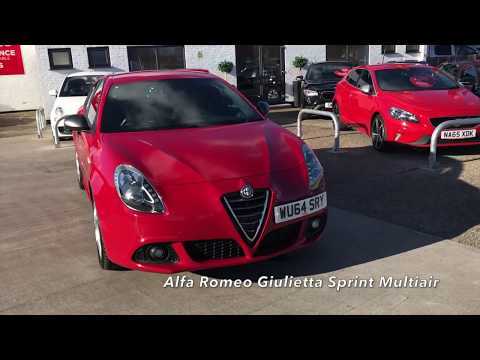 An amazing part exchange here at Pershore Motor Group, this head-turning hatchback is an Alfa Romeo Giulietta Sprint Multiair, which has covered 29943 miles since February 2015 and has a great service history. It is powered by a nippy 1.4 turbo engine giving you 150 BHP and a combined MPG of 49.6. This Giulietta has the Alfa Romeo DNA driving system, meaning you get Dynamic, Natural and All Weather driving modes. This sleek and stylish Alfa Romeo is presented in red with circle style alloys, black mirror caps and door handles, chrome exterior styling and rear privacy glass. The interior has black cloth upholstery with Alfa Romeo logo detailing, Bluetooth, DAB radio, cruise control, front armrest, rear parking sensors, aux and USB connections, and 6-speed manual transmission. Join us for a test drive at Evesham Car Sales, WR11 2FP. Before delivery, this car will have undergone our extensive pre-delivery inspection covering all mechanical and cosmetic aspects of the car. All our cars come with a complimentary 3-month warranty which is extendable, fresh oil and filter change and a minimum of 6 months MOT and service if required. All our customers benefit from our Pershore Motor Group Reward’s Club which gives you FREE MOTs for life, 6 free wash and vacs by our professional team of valeters per year, £250 off your next car purchase with us at any of our showrooms and a £100 refer a friend bonus scheme.